Another slow week due to the Robin Hood Springtime Festival, but it’s been a good run so far and I’m having lots of fun. The Adventures of Strongarm & Lightfoot – Assassins Brawl: Draft two is under review with test-readers. I’m curious to see how many people make notes on bits and pieces I’ve already tweaked in my third draft. Action Figures – Issue Six: Power Play: Pre-editing revisions are done, in the queue for editing. Action Figures – Live Free or Die: Pre-editing revisions are done, in the queue for editing. Action Figures – Issue Seven: The Black End War: I wrote a few pages last week but I need to go back and read everything I’ve written so far to re-familiarize myself with it. Sunday, October 2: The Connecticut Renaissance Faire’s 2016 Meet the Author series, which runs from 1 to 3 PM. Saturday & Sunday, October 15 & 16: The fall New Bedford Bookfest. Times TBA. This week I put in my application to sell books at Arisia 2017, and I expect J.M. Aucoin and I will be back next year, a little older and wiser in the ways of pitching ourselves to prospective readers. With luck, the convention organizers will set up a proper authors’ area that isn’t in a hallway — which wasn’t a bad location, really, but it wasn’t astounding either. So, what, is Mjolnir also a Hydra agent? I just want to throw out a few quick thoughts on the latest kerfuffle in the comic book world, the controversial twist in issue one of Steve Rogers: Captain America that reveals Cap is and always has been a deep cover Hydra agent — which ranks right up there with the idiotic Spider-Clone Saga in terms of ill-conceived character shake-ups. It is an incredibly stupid plot twist that requires readers to ignore 75 years’ worth of stories in order to make it work logically. The Mjolnir issue alone pretty much renders it unworkable. Fans have every right to be pissed off about the story and express their ire verbally and by refusing to buy the comic. Threatening anyone at Marvel, including the story’s writer, is going WAY too far. Grow the hell up. On that note: no, this story did not ruin your childhood. You’re just being a huge drama queen. This will not last, and anyone who thinks otherwise hasn’t read a comic in decades. Comics always revert to the status quo. Remember when Cap died and Bucky took over, and how permanent that was supposed to be? My guess is that this twist will be explained away as false memories and psychic tampering by the Red Skull, who currently has Charles Xavier’s powers (don’t ask). I originally gave it two or three years before everything went back to normal, but considering how vicious the fan backlash has been, I’d be surprised if this arc lasted through the end of the year. In Comics nothing is permanent, not even the word periment itself. 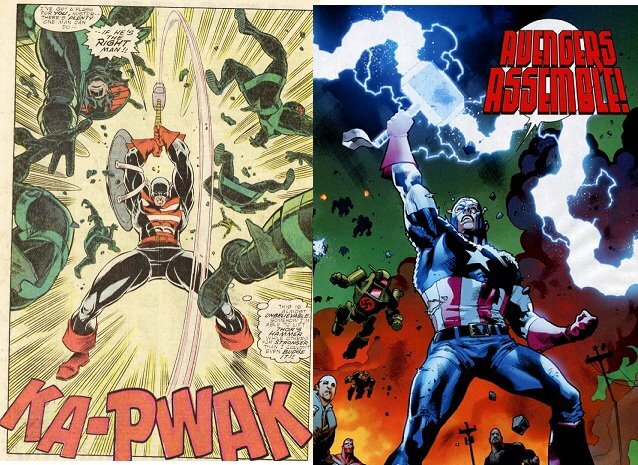 Yeah Cap will be back to normal ( if that even exist as a word in comics} in 4 or 5 issues..only to have some new wackness appear..